In this week of excess, we’re covering gluttony in all its forms — from the traditional face-stuffing variety to people who can’t be regarded as anything other than gluttons for punishment. Here, we feature a woman who straddles the line between the two: 30-year-old Miki Sudo, winner of the famous Nathan’s Hot Dog Eating Contest three years running and the female world-record holder for devouring the most amount of turkey in the shortest amount of time (9 pounds in 10 minutes). Find out why her urge to compete will always outweigh her urge to stop eating. I started competitive eating on a dare. There was a local restaurant that offers a 12-pound bowl of Vietnamese noodle soup. If you could eat the entire meal within a given amount of time, you won $1,500. A bunch of my friends had tried it, and I wanted to give it a shot, too. I turned out to be the only person to ever complete that challenge. I don’t tell my colleagues about my competitive eating. I work at a marketing firm and part time at a restaurant, and I try to minimize it because it raises a lot of questions. Naturally, people find out and look me up on YouTube. It’s flattering, but once one person is made aware of it, it seems like the whole company knows about it. It’s funny—at one of the places I work several people have challenged me to different restaurant competitions. I try to let them know there are only a handful of people in the world who can give me a run for my money, but they refuse to believe that I could beat them at something like this. 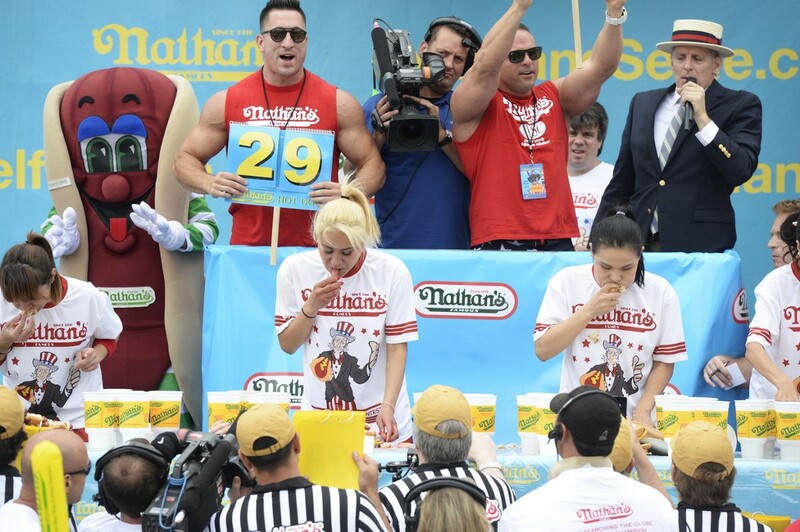 Surprisingly, most of the top competitive eaters are lean and thin. We have competitors that run triathlons and competitors that participate in Ironman competitions. The physically fit competitors tend to perform better — it’s not a hard and fast rule, but it definitely helps. For me, training involves getting my stamina and endurance up and dropping weight. Throughout the year I might be 135 pounds, but sometimes I get down to a pretty lean 120 pounds because I can eat more when I’m leaner and fit. That’s pretty much it — there’s certainly no secret sauce to this. I wish I were more disciplined. Our biggest event is the Nathan’s Fourth of July Hot Dog Eating Contest, and every year, I prepare for that competition later and later. The first year, I gave myself three months; the next, I gave myself two weeks. This year, I gave myself six days to prepare. So my discipline could be better, but I’m always competitive and determined. I’m so proud of my three Nathan’s victories. I’m proud because it’s broadcast on ESPN, and at one point, 8 million households are watching me. Forty thousand people are in the crowd right in front of you. 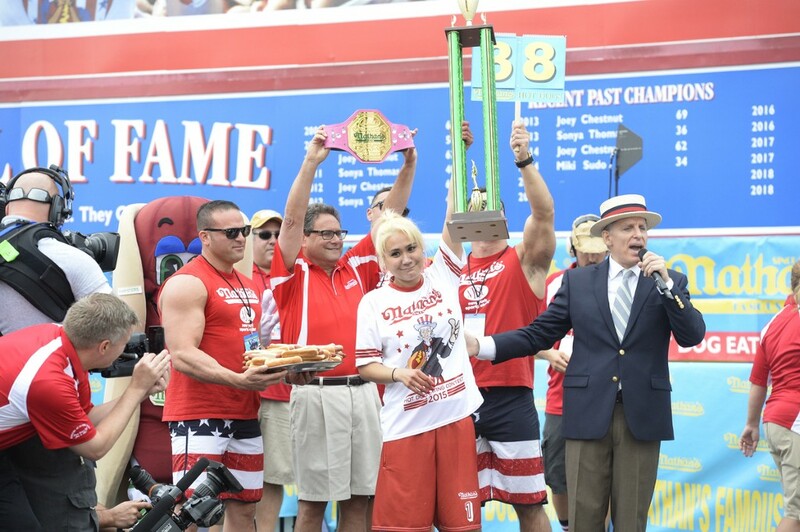 It’s the biggest event in competitive eating, and I won it three years running! Next year, I look forward to breaking the female record of 45 hot dogs in 10 minutes. I’ve done it at home, so I know it’s possible. I won the Foxwoods Turkey Eating contest last year by eating nearly nine pounds of turkey in 10 minutes. We were eating it directly off the turkey. It wasn’t carved, so you just grabbed at it and went for it. I left the drier meat for last — I flipped the turkey over and started going at the undercarriage and the darker, juicier meat. Then I went for the wings, followed by the leg meat and breast. There really was no strategy other than to continuously eat. I once won a contest by eating 61 tamales in 12 minutes. With beverages to wash them down, that’s almost 20 pounds of food in your stomach. It’s not that hard for your body to digest tamales because it’s mostly just cornmeal, but I did feel rather lethargic and tired. The foods that are more difficult to break down are heavily processed meats. Hot dogs are difficult because I barely chew those when I consume them — you’ve got inch-and-a-half-long pieces sitting around in your stomach. After big contests I’m trapped in the crowd for about two hours afterward, so I don’t get to lie down or go to the restroom immediately after. Once the adrenaline wears off, it’s rather uncomfortable, but your stomach processes it in the end. I usually think about quitting competitive eating about four minutes into every contest. Afterwards, if I placed well, I’m relieved and happy. But I question what the hell I’m doing in the middle of every contest, sometimes even right before. When they’re counting down, I’m just like, “Oh damn it, here we go.” I have all sorts of self-doubt. I try my best to tune it out, but it’s always there; you just have to push through it. I tend to watch the footage from Nathan’s to review my technique, and there’s a moment during last year’s contest where I really pushed forward. I pretty much doubled my pace because I realized losing isn’t an option. A lot of people are just happy to participate and be on TV, but that’s not the case for me. I’ve always been very competitive — in academics, in sports, even in the workplace. I like to be thought of as someone who’s dependable, reliable, on time, hard-working and a team player. I figure, if I’m going to invest my time in something, I want to do it well. When it comes to enjoying Thanksgiving dinner, I just think of an eating contest and do the exact opposite. In eating competitions, I’m under time constraints, so for Thanksgiving, I like to take my time and savor every bite.